World Cinema: A Critical Introduction is a comprehensive yet accessible guide to film industries across the globe. From the 1980s onwards, new technologies and increased globalization have radically altered the landscape in which films are distributed and exhibited. Films are made from the large-scale industries of India, Hollywood, and Asia, to the small productions in Bhutan and Morocco. They are seen in multiplexes, palatial art cinemas in Cannes, traveling theatres in rural India, and on millions of hand-held mobile screens. 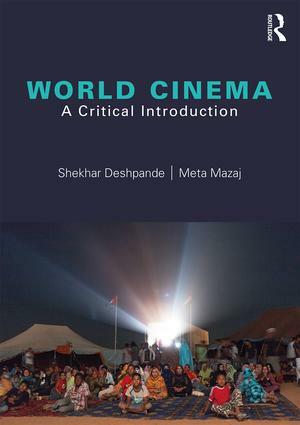 Authors Deshpande and Mazaj have developed a method of charting this new world cinema that makes room for divergent perspectives, traditions, and positions, while also revealing their interconnectedness and relationships of meaning. In doing so, they bring together a broad range of issues and examples—theoretical concepts, viewing and production practices, film festivals, large industries such as Nollywood and Bollywood, and smaller and emerging film cultures—into a systemic yet flexible map of world cinema. The multi-layered approach of this book aims to do justice to the depth, dynamism, and complexity of the phenomenon of world cinema. For students looking to films outside of their immediate context, this book offers a blueprint that will enable them to transform a casual encounter with a film into a systematic inquiry into world cinema.